The priest schrader attachment is the best I have used. Pump fills tires quickly enough and the gauge is easy to read. Two pumps both didn't work upon arrival. First pump out of the box I tried to pump tire and could hear air leaking from pump. Found that pressure gauge was broken and air was leaking from it. Returned and got a replacement pump. Second pump (replacement for first) I didn't even unwrap the shrink wrap plastic and could see the pressure gauge laying in bottom of bag, broken off. The gauge is held in with a simple ring and air routes through hard plastic tube. That plastic tube is apparently fragile enough to be broken during shipping. I wouldn't buy one. Even if you receive a working pump where the gauge wasn't knocked loose during shipping, my guess is it's a matter of time before the gauge fails. Excellent Pump at a Very Good Price! High volume pump (Max 60 psi) is what I need and use for all of our mountain bikes as well as occasionally adding pressure to car and truck tires. I have a nice electric pump but would much rather use the manual Lezyne versus unraveling and dragging an extension cord all over the garage and around vehicles. This pump allows me to add five psi to large truck tires in less than half the number of strokes required with my previous high volume manual bike pump. In addition, the quality of the materials, CNC machining and fitting is evident throughout. You might get five to ten percent better with a more than $400 Italian offering but this one exceeds my expectations and I couldn't be more pleased. Also, love the way it screws on and off valve stems which is much easier than throw levers and minimizes air loss from tire during attaching and detaching. Pumps up the mountain bike tires with ease. The low pressure gauge is great for getting accurate readings on my mountain bike tires. It takes no time at all to fill up 29er's and oversized tires. I like the threaded stem, the air stays in when you release the pump. Very good quality and worth the price. 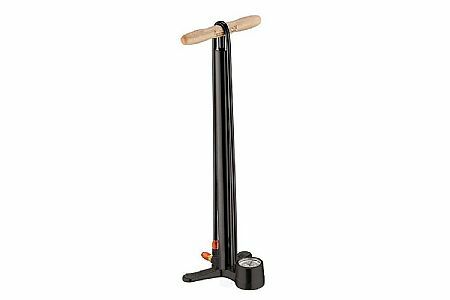 BEST floor pump & has replacement parts available too! It take a minute to figure out how to screw the locking twist system, but after that it's awesome! The slide back release action is very forgiving on light weight valves. With the 90 degree angle of the pump head it's easily removed from the tire. These pumps have replacement parts available & can be rebuilt if need be, Looks good too.